It may be a story of extreme cruelty in the name of science. It may also be about fraud. You be the judge, writes DON PINNOCK. This story certainly involved the death of hundreds of wild animals which underpinned a doctoral dissertation plus a paper in the British Ecological Society’s Journal of Applied Ecology. The principal author of the paper was Liaan Minnie of the Nelson Mandela Metropolitan University and was published under the rather arcane title Compensatory life-history responses of a mesopredator may undermine carnivore management efforts. The study uses many graphs and terminology opaque to non-scientists, but in essence the thesis is that if you kill black-backed jackals, the control exerted by the alpha pair falls away and all the females start breeding. And if you reduce numbers by culling, neighbouring jackals move into the vacuum, an effect called source-sink dynamics. So you end up with as many or more jackals than when you started killing them. This is, essentially, old information known for many years, but it’s always useful to get some scientific backing. What has raised a storm, which I’ll outline shortly, is the method of data collection and its presentation. To prove his thesis, doctoral researcher Minnie wanted to see if jackals on farms on which they had been hunted were younger than in reserves where they were not hunted. This, indeed, he found to be true. His finding involved the death of 573 jackals – 327 on farms and 246 in protected reserves, including the Addo Elephant National Park, The Karoo National Park and the Mountain Zebra National Park. Photo: Addo National Park 2010 jackal cull sites. In his thesis, Minnie points out that jackal populations in national parks are generally un-managed, but “samples became available during once-off experimental population reductions by South African National Parks to reduce predation on small- to medium-sized ungulates”. He adds that jackals in these areas had never before been hunted, which of course does raise questions about the congruence of his thesis and the need to hunt them. There are, in fact, even more troubling questions raised by environmentalist Dr Bool Smuts of the Landmark Foundation, who’s been worrying around this study for several years since he first discovered it. Why, he wondered, kill a naturally occurring predator in a national park? Were we looking at an unethical cull of jackals for the sole purpose of publishing a paper and scoring a PhD? Did using a huge cull for research have the prior approval of the Nelson Mandela Metropolitan University? If so could he please see the ethics permit? During a series of increasingly irritated emailed questions to the researchers, their professors, the NMMU and finally the vice-chancellor, he was referred on… and on… over several years and told he could have the information when the study was published. But no ethics permit emerged. The second complaint was even more serious, academically speaking: that the data was fraudulent. The grounds for this claim took me a lot of puzzling through reports, dates and emails. The nub is the journal article’s claim to compare jackal populations in previously culled and previously un-culled areas between October 2011 and October 2012. The research hypothesis was that un-culled populations had an ageing population structure and culled populations did not. This claim rests on jackals in the parks being natural and un-hunted. But Smuts points out that in 2010, in the precise parks on which the later study rests, culling did take place, but that the authors (who must have known it, being jackal specialists) chose not to disclose it. This, he insisted, undermined their argument and was tantamount to academic fraud. And, of course, a shocking waste of jackal lives. The fact that the 2010 culls did indeed take place emerged in questions asked about it in Parliament that year by Democratic Alliance MP Ian Davidson. Written replies by the Minister of Water and Environmental Affairs, Edna Molewa, were enlightening. Essentially, because there were no super predators like lion and cheetah, she said, jackals were spreading and taking down too many springbok. She listed culls of 207 jackals in Addo National Park and 132 in Karoo National Park in 2010 as a response. She mentioned two other facts that appeared to counter the reasons for the culls. Springbok in parts of Addo and in Mountain Zebra and Karoo national parks were “neither increasing nor declining”. And lion and cheetah were about to be introduced to these areas, which would curb jackal predation (so why cull them?). “The Nelson Mandela Metropolitan University through its scientists… were untruthful in their data submission to the Journal of Applied Ecology. “There was no ethics approval at the time for the participation of NMMU scientists in the mass slaughter of over 600 jackals within South African National Parks (2011-2013), a slaughter that was highly questionable both from the ethical and scientific perspective given the facts provided both to the NMMU and the journal. “The age demographics of a jackal population severely culled in 2010 (108 individuals) was claimed by the authors to have the same age demography when culled two years later in 2012 (108 individuals). According to Smuts, “the exact coincidence (108) between the undeclared cull numbers and ages of 2010 and the study cull a mere two years later is highly improbable and probably beyond the outer limit of possibility. It calls into question the truthfulness of the data.” It is unclear, he said, why the authors chose to misrepresent the data to the scientific community. Parker, in his report, took a more considered, academic view of the non-disclosure matter. The authors, he wrote, should “submit, without delay, an addendum to their paper clearly stating that they were fully aware of the 2010 black-backed jackal cull but chose not to disclose this information in the original submission”. Smuts was less conciliatory. In a letter to NMMU Deputy Vice-Chancellor and head of Research and Engagement, Prof Andrew Leitch, he said that “the paper needs to be withdrawn from the journal and a note detailing the reasons needs to be published, the PhD rescinded and the academic fraudsters reprimanded”. Did this research add anything new to what we already know? Did it intentionally misrepresent the facts and, if so, why? 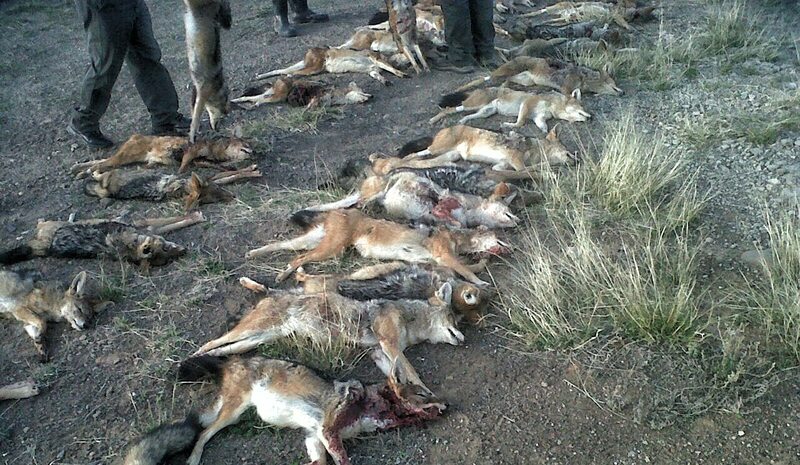 Was it warranted or even ethical to kill so many jackals? Was the cull not perhaps the result of pressure on park officials from farmers around the reserves to reduce “leakage” of park jackals on to their lands? If so, was the academic study a useful cover story for the cull? The university, for now, seems to have closed the book on the issue. Professor Leitch said he would get back to me. A month later he hadn’t. Same story with SanParks. Can we presume they concur? Or simply hope it will all go away? Main photo: Jackal cull in Karoo NP 2012.